Dennis L. Dean, age 76 of Luzerne, Michigan, passed away at Otsego Memorial Hospital on Wednesday, October 18, 2017. Dennis was born in Highland Park, Michigan on June 18, 1941 to Howard and Lenore (Dixon) Dean. Dennis had been a State Champion Swimmer in High School and married Helen Abbott on July 10, 1971 in Rochester, MI. The couple lived in Madison Heights, MI until Dennis’ retirement from General Motors Chevy Gear and Axle, where he worked as a supervisor over skilled trades. The couple settled in Luzerne in 1996 to their property that they had owned since 1971. Dennis was an active member of Tripoint Church of God (formerly Mio Church of God) where he served as an usher. He was also involved with Angel Food Ministry and Together We Can Food Pantry in Mio. He had belonged to the Carlton Sportsman’s Club. Dennis was an avid outdoorsman. He enjoyed hunting and fishing, and was especially fond of hunting trips to South Dakota with his friend Pat Sposato. He also enjoyed golfing, motorcycle riding, snowmobiling, ice skating, and playing hockey. He enjoyed spending time with his friends and family. 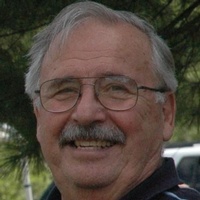 Dennis is survived by his wife Helen of Luzerne, MI; his children: Scott (Kristi) Dean of Nashville, MI; James (Lee Ann) Jones of Lapeer, MI; Debra Booth of Luzerne, MI and David Dean of Lansing, MI; his brother Bill (Brenda) Dean of Dade City, FL; his grandchildren: Leila Hollister, Lacey Dean, Rebecca Blakeney, Ross Blakeney, Travis Jones, Neil Jones, Ryan Jones, Tristan Jones, Robert Scarcella, Jr., and Dennis Scarcella; his great-granddaughter Lily Ann Louise Scarcella; and many nieces and nephews. He was preceded in death by his parents, his brother Thane Dean, and his sister Annette Wood. Visitation on Sunday, October 22, 2017 from 1 -4 PM and 6 – 8 PM at the Lashley Funeral Home, Mio, MI, and also on Monday, October 23, 2017 at Tripoint Church of God, Mio, MI from 10 AM until the Funeral Services at 11 AM with Pastor Chris Bones officiating. Interment will follow the Funeral Service at Luzerne Cemetery, Luzerne, MI. Memorial donations may be made to Tripoint Church of God. These arrangements were handled by Lashley Funeral Home, Mio, MI. Dennis, well remembered, one of the guys, from our days at John C. Lodge Elementary School. He lived on Lenore, adjacent to Grand River. good guy, fine life, great (fast) swimmer at rhs (freestyle sprinter). condolences to dennis' family and loved ones.